Randall Crane has a nice article on markets vs. planning. I put together a lecture notes on this topic once, which I post below. Nobel Prize Winner in Economics (1974) F. A. Hayek called the belief in Soviet Style socialist planning the “Fatal Conceit.” Planners, even if smarter than any individual in the market, cannot possibly know more than the market as a whole. Acquiring one bit of additional data is just adding a glass of water to the ocean of information that the market possesses. However, even Hayek conceded the need for so-called “Piecemeal Planning” to achieve coordination in small areas, see Constitution of Liberty. A second issue is whether that planning is more appropriately done in the public or private spheres. Planning determines the outcome of the game. This is planning as designer or player. To prepare for future contingencies, lowering the cost (in money, time, political effort) of dealing with anticipatable future outcomes. If the forecast is for rain, it is prudent to carry an umbrella. To establish a vision of the future to guide present action. To graduate with a degree in Urban and Regional Planning, I must take PA8202. Transportation is, for better or worse, a public enterprise with long lasting consequences for decisions. There exist economies of coordination which may (but not necessarily) be difficult to achieve in the absence of planning. For instance, we want to ensure that roads from two different counties meet at the county line. Owners of developed land have a right to service from public and private infrastructure. As infrastructure is costly and the economics of financing it are crude (though they need not be), planning is a substitute for the market. In a market, equilibrium (Pp, Qp) occurs where marginal private cost equals marginal willingness to pay or demand. However if there are externalities, costs that are not borne by the parties to the transaction (e.g. noise pollution, air pollution, and congestion), there is a marginal social cost that is higher than the marginal private cost, leading to overconsumption. The first best solution is to price goods at their marginal social cost, imposing an additional charge. However, the same effect can be achieved by establishing a restrictive quota on demand (Qs). There are other approaches to the problem besides directly increasing taxes or restricting demand. The libertarian approach for instance is the use of lawsuits, and fear thereof, to bring about good behavior. If you create a nuisance for your neighbors, they could sue you and the courts could force you to behave better. This shifts the problem from legislators and bureaucrats to judges and juries, which may or may not be an improvement. However, while this is easy to do for some kinds of obvious nuisances, it poses more problems for widely distributed externalities like air pollution. Ronald Coase (1992) argues that the problem is that of actions of economic agents have harmful effects on others. His theorem is restated from George Stigler (1966) as “… under perfect competition, private and social costs will be equal.” This analysis extends and controverts the argument of Arthur Pigou (1920), who argued that the creator of the externality should pay a tax or be liable. Coase (1992) suggests the problem is lack of property rights, and notes that the externality is caused by both parties, the polluter and the receiver of pollution. In this reciprocal relationship, there would be no noise pollution externality if no-one was around to hear. This theory echoes the Zen question “If a tree falls in the woods and no-one is around to hear, does it make a sound”. Moreover, the allocation of property rights to either the polluter or pollutee results in a socially optimal level of production, because in theory the individuals or firms could merge and the external cost would become internal. However, this analysis assumes zero transaction costs. If the transaction costs exceed the gains from a rearrangement of activities to maximize production value, then the switch in behavior won’t be made. There are several means for internalizing these external costs. Pigou identifies the imposition of taxes and transfers, Coase (1992) suggests assigning property rights, while government most frequently uses regulation. To some extent all have been tried in various places and times. In dealing with air pollution, transferable pollution rights have been created for some pollutants. Fuel taxes are used in some countries to deter the amount of travel, with an added rationale being compensation for the air pollution created by cars. The US government establishes pollution and noise standards for vehicles, and requires noise walls be installed along highways in some areas. Is there a right to be free of pollution, noise, or nuisance of various kinds? Donald Krueckeberg cites Christman who defines 9 separable kinds of property rights: Possession, Use, Alienation, Consumption, Modification, Destruction, Management, Exchange, Profit Taking. Land use planning, and government in general, concerns itself with restricting individual property rights for the common good. Krueckeberg introduced many historical arguments, which while nice, don’t necessarily answer the questions of what the relationship should be. Furthermore the idea of “natural rights” is hopelessly illogical in a world of Darwinian competition. “Property is Theft” – all natural inheritances derive in part or whole from force and fraud. As historical fact this is hard to argue with. This forms part of the anarchist worldview. But so what if property is theft? A stable system of property relations is necessary to have a functioning economy, to encourage long term investments. Belief that your property can easily be taken, or taken without recompense, will discourage long term investment. Hypothesis: Planning was established by the state to provide long term certainty regarding property relations and the need for takings. Hypothesis: Planning was established to reduce transactions and coordination costs. Whitehead identifies a number of problems in urban land markets, some commentary is provided below. 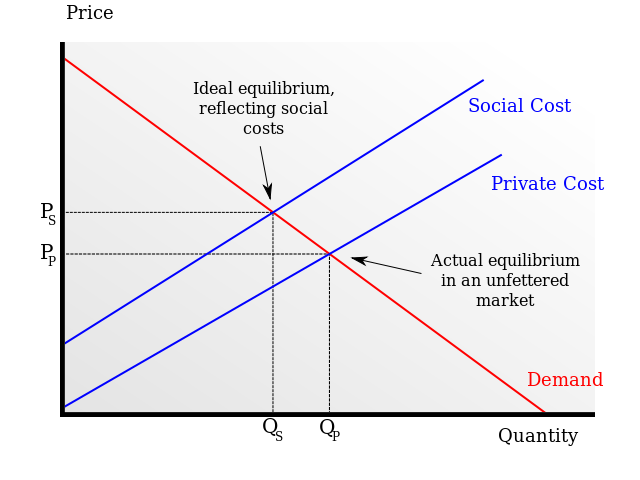 Conventional economics often uses the term Public Good to identify products that are logically provided by the public sector, as opposed to Private Goods. Two criteria can help classify a good as public or private: excludability and rivalry. Excludability implies that the good’s provider can prevent a user from obtaining it without charge. Rivalry implies that one person’s consumption of a particular good prevents another individual from consuming it. Table 1 summarizes the goods by type. The classic example of a pure public good is national defense, though many goods exhibit these properties to a greater or lesser degree. The extent to which roads are a public goods depends on what degree of the excludability and rivalry that they contain. Existence of locational externalities Are locational externalities simply a property rights problem? Do planners really know better. The reply is simply Hayek’s Fatal Conceit. Unequal division of market power among economic agent. Unequal division of market power is necessary to achieve economies of scale and scope, efficiencies from doing things big or broadly. Communities don’t value anything. There is no guarantee of a consistent aggregate social welfare function that even a majority can agree on. Person C prefers blue to green and green to red. and two people prefer green to red. Differences between individual and community risk perception. There is an economic discount rate, which may be lower for communities than individuals because communities can borrow more cheaply, they tend to be lower risk for lenders than individuals. But each investment, treated on its own, should have the same discount rate applied to it. Interdependence in utility arising from “merit goods,” consumption of which by one individual benefits others. Do merit goods exist. While there may be an external benefit to some things, it is rare that there is not a much larger internal benefit. For instance, education or good housing benefit the recipients much more than society. Income redistribution. All income redistribution schemes reduce the incentive to work by some amount, and the long term confidence in the system. While in the U.S. they have been kept manageable, these schemes have undermined the economy of many countries. Do community decisions require government decisions? To what extent does planning require government? For instance, Columbia, Maryland was largely private sector (with some public provided goods). Can private arrangements substitute for government mandates? Privatopias, covenant arrangements, etc. What would the world look like without land use planners and their plans? Coase, Ronald H. 1992. The Problem of Social Cost, and Notes on the Problem of Social Cost reprinted in The Firm, The Market and the Law University of Chicago Press: Chicago. Krueckeberg, D. 1995. “The Difficult Character of Property: To Whom Do Things Belong” Journal of the American Planning Association 61: 301-9. Pigou, A.C. 1932 (1920 orig.) The Economics of Welfare, 4th ed. Macmillan and Co: London. Whitehead, Christine. 1983. “The Rationale for Government Intervention.” In Urban Land Policy: Issues and Opportunities, H. Dunkerly, ed. New York: Oxford University Press.